USD strengthens against CHF. 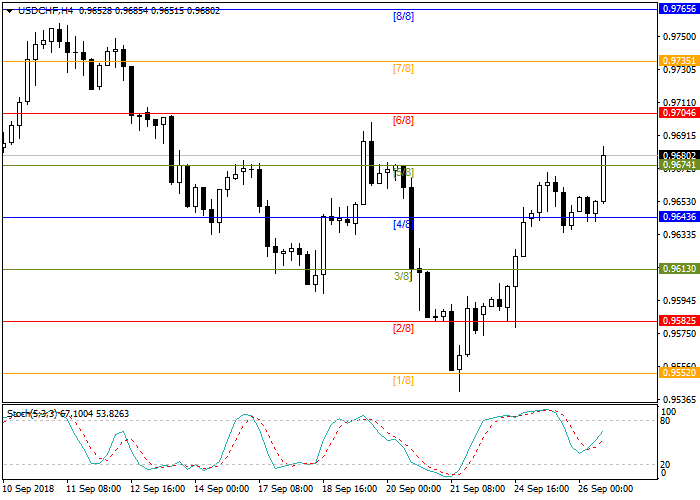 The pair broke the resistance level of 5/8 Murrey (0.9674) and is now growing to the level of 0.9704. USD is supported by strong statistics: in September, the consumer confidence index rose to 138.4 points against 134.7 points a month earlier. The index of production activity also increased to 29 points. The data reflect that the US economy continues to grow, and consumers feel confident and ready to spend more. Today, traders are waiting for the publication of the Fed's interest rate decision: it is expected to grow by 25 basis points. Fed's Monetary Policy Statement release will follow it. As for the global news, the market has learned about the EU's plans to prepare a new payment mechanism that will allow most European companies to work with Iran, despite US sanctions. If the system is implemented, the relations between countries can tighten. Stochastic is around 67 points and does not give signals for opening positions. Long positions can be opened from the current level with the target at 0.9704 and stop loss 0.9650.